The design of self-ligating braces (including Damon Braces and Speed Braces) is based on the principal that the force used to reposition teeth should not overwhelm the specialized tissues surrounding and supporting the teeth. Instead, the bare minimum of force should be used to stimulate the cellular activity required for tooth movement. The elastic bands used with traditional braces act like a bungee cord, placing friction and pressure on the teeth. This pressure also slows down the movement of the teeth. In contrast, passive, self-ligating braces use special brackets that are nearly frictionless. 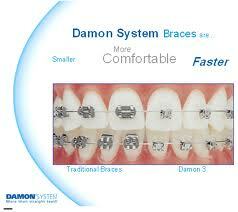 Your orthodontist at Quintessence Specialty Orthodontic Dental Clinic offers the Damon Braces System. These braces have a small “trap door” structure, which closes over the arch wires stretching from bracket to bracket. These brackets allow the wire to move more freely and are smaller in appearance than standard braces. Your orthodontist at Quintessence Specialty Orthodontic Dental Clinic uses a hook-like tool to open the trap doors, and then push them closed, once the arch wire is in place. There is almost no resistance between bracket and arch wire, so only a small wire is required to gently move teeth into place. Self-ligating braces reduce discomfort and treatment time an average of two months. 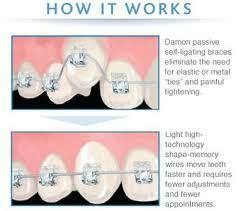 WHO CAN WEAR SELF-LIGATING DAMON AND SPEED BRACES? Self-ligating braces are best suited for patients aged 13 to 60-plus. Your orthodontist at Quintessence Specialty Orthodontic Dental Clinic will help you decide if these are the best braces for your needs. Call us at 08040991979, 9964464094 9886878921 or send an email to schedule your initial consultation.